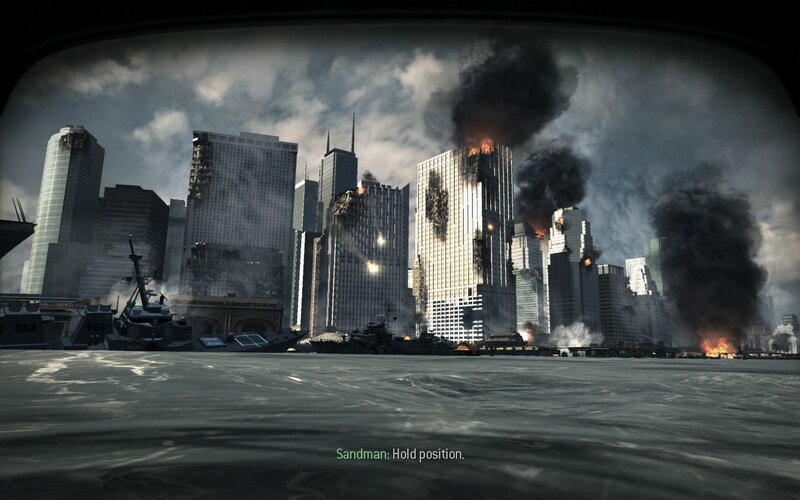 Call of Duty Modern Warfare 3: A Spectacle Like No Other. As game releases goes it doesn’t get much bigger than the Call of Duty series. The most recent instalment in the series, Modern Warfare 3, was released just last week and has already sold a whopping 6.5 million copies. That number doesn’t include sales outside of the USA or the UK and even that’s enough to make Modern Warfare 3 the biggest entertainment release of all time across any medium. Considering that Modern Warfare 3’s predecessors also set records of similar calibre in their time it should come as no surprise that they were able to do it once again. The question remains though are those sales figures indicative of something innate about Modern Warfare 3 (I.E. is it actually a good game) or merely a product of solid marketing? For the first time on The Refined Geek I was sent a copy of this game to review and I’ve spent the past week diligently doing so. Modern Warfare 3 drops you hours after the events that unfolded in Modern Warfare 2 with Soap slowly dying whilst you, playing as one of Nikolai’s best soldiers Yuri, attempt to help save him. Meanwhile World War 3 is still continuing and you’ll then play as Frost one of the members of Delta Squad who’s been charged with driving the Russians out of New York by using one of their own attack subs against them. Throughout the single player campaign you’ll switch between Frost, Yuri and (towards the end) Price as you play out different parts of the larger story arc. Now I’ll be honest here, when I reviewed Battlefield 3 a week ago I criticised its single player for being tedious but I couldn’t shake the feeling in the back of my head that I’d been overly harsh on it. For the most part I figure that was because I was expecting too much for the single player when at its heart Battlefield 3 is a multiplayer game just like Modern Warfare 3 is. However the differences between the two games single player campaigns could not be more stark as right from the get go Modern Warfare 3 sets the stage for action packed, run and gun fun. It only took me half an hour with Modern Warfare 3 to realise that Infinity Ward are extremely adept at crafting an epic cinematic experience, one far superior to that of Battlefield 3’s single player. Indeed the set pieces you’ll play in are quite spectacular. The environments you’ll play in are quite varied, ranging from towering city scapes to the vast depths of a Russian diamond mine. Whilst many of the campaign scenes form the basis of the multiplayer maps they are thankfully not the same maps like in Battlefield 3. 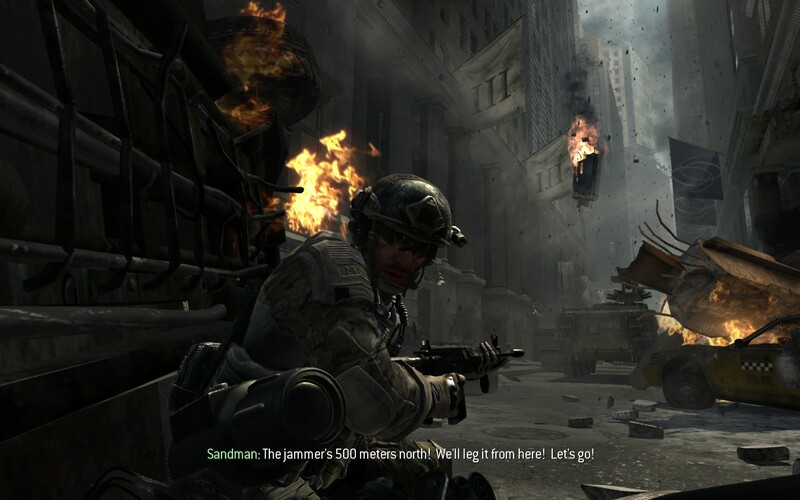 For the most part the single player sections of Modern Warfare 3 are quite intimate with most taking place in what can be most aptly described as a giant corridor. It’s not a particularly bad thing but compared to Battlefield 3’s expansive environments it can leave you feeling a little wanting for the giant environments of yore. Still they’re usually littered with alternative paths which open up all sorts of different tactics. 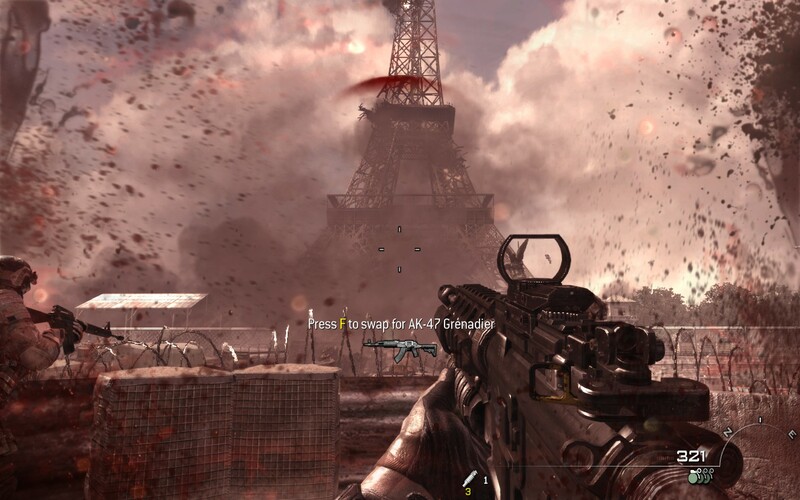 Combat in Modern Warfare 3 is polished to the point of perfection. Whilst the cover based regenerative health style of game play is far from inventive Infinity Ward has it down to a T so well that the only complaint you can have about it is the unoriginality. The NPCs that accompany you, whilst not being on the same level as a real human, are not the next to useless meat bags that plagued me in Battlefield 3. Combine these with weapons (and on occasion awesome gadgets like the UGV pictured above) and the combat is satisfying, gritty and above all just plain fun. If there was one genuine complaint that I’d level at Modern Warfare 3’s combat is actually too easy. Now according to my time with Robert Bowling each of the platforms recieved the same amount of development time which kind of rules out my theory that the PC version is a well polished port that dumbs down the difficulty for those who have to aim with their thumbs. Now I didn’t play the game through on its hardest difficulty, opting for Hardened or whatever the second hardest was, but this is a complaint I’ve heard echoed by several other people who have played on the hardest setting. 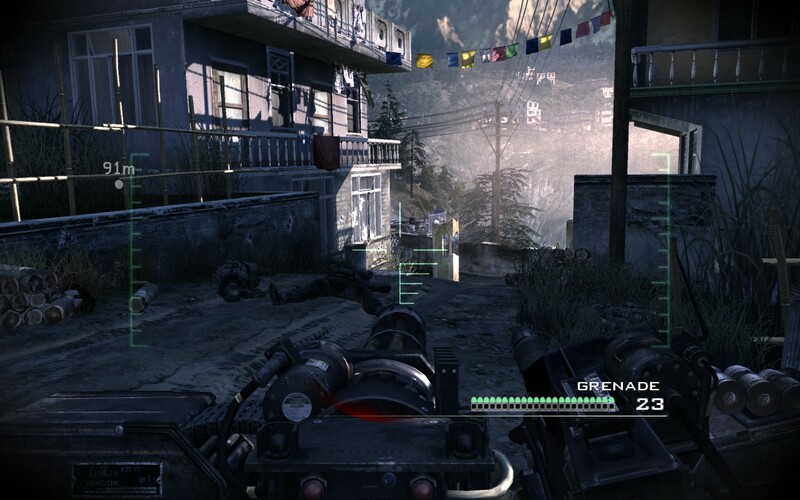 It could be argued that this lack of difficulty is one of the things that adds to the enjoyment of the game (and indeed it does mean that it’s a very well paced game) but it does make Modern Warfare 3 stand out as something aimed more at new comers to the series rather than seasoned FPS gamers like myself. Thinking about it more there are quite a few signs that Modern Warfare 3 tends much more towards the playable movie side of the spectrum than your traditional FPS title. You’ll spend the entire game following someone and taking their orders rather than being let out on the loose by yourself to try and accomplish the mission. If you dare to deviate from the carefully constructed plot you’ll usually be greeted with a mission failed or flooded with waves of enemies you can’t hope to defeat. In that sense then if you think of Modern Warfare 3 as a playable movie more than a game then it accomplishes that quite well, even if that’s counter intuitive to what you’d expect from a game like this. Overall the single player is a great way to blow 4~5 hours and whilst it might feel like you’re on rails and everything is a tad too easy ultimately I found myself having a blast playing the hero in Modern Warfare 3. One of my friends captured the essence of Modern Warfare games aptly by saying they’re like a Matthew Reilly book: an action packed read with a plot that’s nothing deep but enough to get you by; an afternoon of solid entertainment. Of course everyone knows that the single player is just a mere distraction on the road to the real reason why everyone buys the Modern Warfare games: the multiplayer. 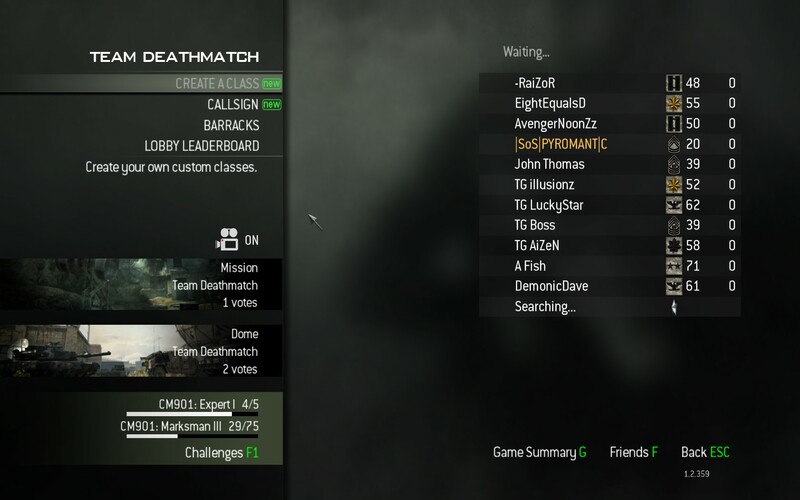 Honestly at first I was thoroughly confused with the multiplayer in Modern Warfare 3. Sure I had played it back at the preview a couple months ago and nothing had really changed in the interim (as far as I could tell) but the differences between Treyarch’s and Infinity Ward’s style of multiplayer is quite stark. For starters nearly everything in the game has a level attached to it from weapons to perks to you the player. At the start this is somewhat overwhelming especially when you consider that the built in classes have access to weapons and perks that you can’t unlock until later levels. Indeed you can’t create your own class until level 4, leaving you to stumble through the first few without a class that you created. For someone who got kind of used to making his own choices this was a bit irritating, but it didn’t last for long. Levelling in Modern Warfare 3 is incredibly fast paced with rewards, unlocks and achievements being thrown at you constantly for doing almost anything in the game. Unlike Black Ops where you’d spend in game cash to buy upgrades for your weapons they’re instead unlocked progressively as you use the weapon in multiplayer matches. This is good and bad as you don’t have to worry about not having the cash required to get the upgrade you want but it also means that the best upgrades are reserved for those who use the weapon the longest. You see I found it quite fun in Black Ops to be able to switch to a completely new weapon and deck it out fully before diving into another game with it. In Modern Warfare 3 this isn’t really possible as I’d instead have to grind out that weapon in order to fully unlock it. The result is you pretty much stick with one weapon until you unlock the next best one, which can take a little while. All that being said though it only took me about 4 hours of play to reach level 22 which isn’t bad considering the level cap is 80. What did disappoint me however was the lack of dedicated servers for ranked play. You see with Black Ops you had the familiar server browser where you could find the servers you wanted to play on and go play there. Modern Warfare 3 brings back the dreaded peer to peer system for ranked play and leaves the dedicated servers for strictly unranked play. I can understand why this decision was made but the fact of the matter is that peer to peer multiplayer is a sub-par experience for PC gamers. Whilst initially I found it to be trouble free the last couple hours saw many host migrations with several of them ending with me being disconnected from the game completely. Black Ops (and Battlefield 3) had none of these issues and they also don’t seem to struggle with hackers on their servers either. It’s unfortunate that Infinity Ward choose this direction again but it looks like they’re set in their ways with this one. Call of Duty: Modern Warfare 3 stands as a testament to Infinity Ward’s ability to produce AAA titles time and time again. Sure they’re unoriginal and formulaic but they’ve got that down so well that when you start playing them all those thoughts melt away a cacophony of explosions, explicatives and enemies. The multiplayer is, as always, thoroughly enjoyable and the persistent levelling system will see me playing it long after this review is written. It’s not all roses however and the things I’ve panned Modern Warfare 3 for could have easily been averted by Infinity Ward. Overall Modern Warfare 3 is a great game and I wouldn’t hesitate to recommend it to long time Call of Duty fans and new comers alike. Call of Duty: Modern Warfare 3 is available right now on PC, Xbox360 and PS3 right now for $89.99, $79 and $79 respectively. Game was played entirely on the PC on Harderned difficulty with 4 hours and 37% completion. 4 hours of multiplayer was also played with majority being spent in the team deathmatch mode. A copy of the game was provided to The Refined Geek for the purposes of reviewing.